Bali’s eastern neighbour, Lombok, is only 20 minutes away and is known widely as the quieter side of Bali. Lombok is a bucolic haven, where horses and carts traverse narrow dirt paths across golden horizons and men work in conical hats across isolated rice paddies. Still, the island attracts a steady flow of tourists each year thanks to its unique and private charms. Its dense green interior is fringed by white sand beaches, offering intensely beautiful sunsets, iconic to the island. 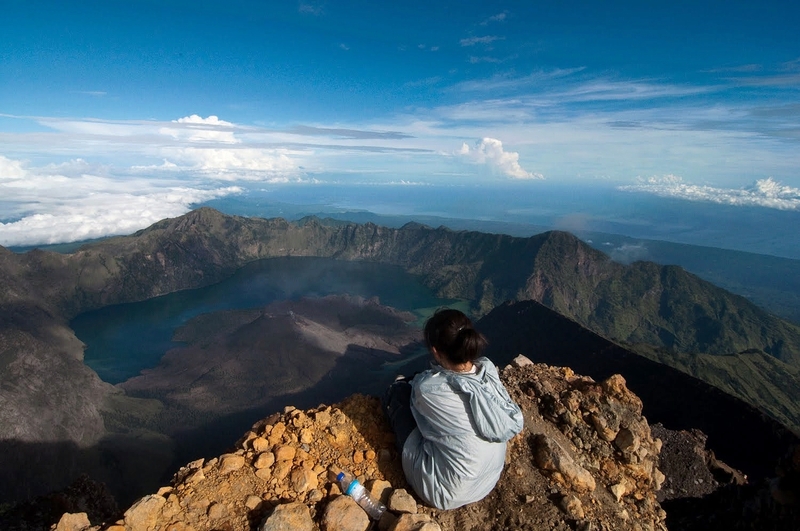 Lombok is also home to nature at its fiercest, with the mighty Gunung Rinjani volcano standing tall, casting its awe inspiring shadow across the region. Rejuvenating hot springs are abundant on the island, a perfect way to unwind and enjoy the island way of life. Lombok is a multifaceted island and its energetic capital, Mataram, has a distinctly Indonesian vibe; a jumble of classic markets and old Hindu temples, surrounded by whizzing motorcycles. Trade in Lombok often takes place on the beach, where tourists can barter with local hawkers over everything from extravagant pearls to barbequed fish, whilst relishing the clamour of old fashioned commerce. Roaring karaoke bars in Senggigii full of sun burnt tourists and seasoned locals are a must for travellers seeking exciting nightlife. Built in 1744 AD this Mayura Temple was originally named Kelepug Palace Garden, after the sound made by the water from a spring that gushed into the palace pool. More than a century later, in 1866, the temple and surrounding park were renovated and renamed Mayura Park Temple. The new name comes from the Sanskrit mayura – meaning peacock. Peacocks were bred around the temple and park to eat the snakes that had become a nuisance by disturbing locals that had gone there to worship. Pura Meru, Lombok’s largest Hindu temple, was built nearly 300 years ago as a dedication to the Hindu Holy Trinity. The temple is one of the most important religious buildings on the Island as well as one of the most famous tourist attractions, and festivals and special ceremonies are still held at the site. Each of the temple’s multi-tiered teak shrines or meru symbolise different gods; Bramhma is honoured at the south meru, Vishnu at the north, and Shiva in the centre. This bike tour takes you through the Batulayar district of Lombok on a bicycle. Tourists get the opportunity to cycle through traditional villages and witness local artisans working on various crafts before heading out into the luscious countryside. Here you will see Balinese temples and curious wildlife before stopping to meet the friendly villagers in the places you stop. A gondola ride is also included in the tour. What theHakiki Innlacks in material luxuries is more than compensated for by the staggering beauty of its location. With a view of the Gunung Rinjani Volcano and the sound of nearby waterfalls, Hakiki Inn rests in the middle of the picturesque sawas (rice fields). It is made up from ten huts that rest at the base of the volcano, about 2 km from the Gunung Rinjani National Park. The huts provide basic shelter for guests, and although not designed for style, they soon feel like home after a warm welcome and some of the best home cooked food on the island. The Ressa homestay is a small business about 15 minutes’ drive away from Sengiggi – the main tourist strip on Lombok Island. Tourists without a car or bike have the option to hire one in town cheaply or use a local taxi company. The quiet homestay is set back from the main road and radiates a peaceful vibe. Ressa Homestay guests can enjoy a free breakfast, internet and room service. There is also fresh bed linen, a daily maid service and the rooms all have their own shower and toilet facilities. As they all target different budgets, however, the standard can vary slightly.